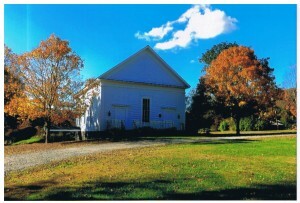 The Stockbridge Meeting House in Stockbridge, Vermont is located at the head of the picturesque Stockbridge Common just 2/10 of a mile off Route 100 at 97 Common Road. We are 10 miles from Exit 3 off I-89 and just 25 miles from Route 7 in Rutland. The Meeting House has been well maintained and just undergone a major renovation which included the addition of a walk out basement with a fully appointed kitchen, two restrooms and tables and chairs for 50 guests. A ramp was added for entry into the main auditorium which maintains its elegant, yet simple, design and can hold up to 150 guests for large gatherings. The facility is available for rent for weddings and other social gatherings. The Stockbridge Meeting House is a 501 (c) ( 3 ) tax deductible organization.